Safety and comfort come as standard on the HRX 476 QX. 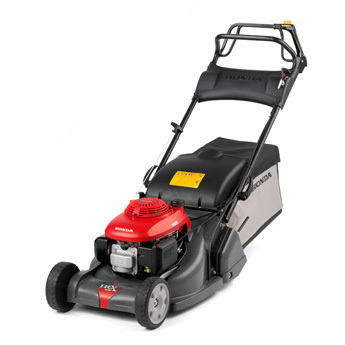 It’s easy starting 4-stroke engine also effortlessly drives the mower forward. Simply hold the drive lever to the handle bar and let the mower do the work. Honda’s unique Roto-stop technology allows you to stop the blades without stopping the engine, for quick and safely unloading the grass bag or crossing the gravel. This model features a rear roller to give you the striped finish of a formal lawn. The compact size and perfect balance gives greater manoeuvrability around a medium size garden where you may have tight curves and turns. A central height adjustment makes it easy to achieve the perfect cut for your lawn from a single lever with 5 height settings. Once you’re done, the one-touch folding handles makes storage simple too.